At Point Lookout, Maryland, earth turns into a sharp needle, stitching St. Mary’s County into the Chesapeake Bay, and all along the beach, a snaky filament of white cotton surf tries to thread itself back into the needle’s eye. These waves. Wind beating ocean’s drum skin thousands of miles away, wind switching on ocean’s lamplight, thousands of miles away, wind gifting itself to ocean’s embrace, thousands of miles away and precisely now, the energy that was wind, precisely and exactly here, the energy gifts itself onto the shore as waves of water, tumbling, surging. As waves of sound, crashing, dashing. As waves of light, throbbing, pulsing. These waves. Even as they leave the bay for the beach, they depart the beach to return to the bay. The simultaneity of them. Not this coming then that going, but both together, coming and going, arrival and departure, the boundary between this and that, between then and now, blurring, in the swirling surf, blurring, in the watching woman, blurring, the waves and the woman, two tines of a tuning fork, struck, reverberating as one pure note. Call it eternity, or infinity, or forever. Or call it love. On the way down to the beach, I passed a family out for a stroll. Mother, father, child. I asked the little girl, “Are you having a nice walk?” She replied, “I love my Daddy.” I thought, Out of the mouths of babes! Love is the answer to every question, a perpetuity of give and take, the child offering to me what she received from her father, the tumbling, surging surf offering to earth what it received from air, giving back to water what it’s taking from land. A triune transmutation of energy, endless in its duration, constant in its changeableness. Yes, call it love, the surf, and hold fast to it through your days and nights. As you wake, with salty dream-fingers still clutching the pristine sand of your barely conscious mind. As you plod to the bathroom to brush your teeth, each footfall a transmutation of energy given to the floor from your body, from yesterday’s meals, last month’s crops and critters, last year’s sunshine, all of that now offered back to earth precisely and exactly here, in each shuffling footstep that echoes – doesn’t it? – the sibilant shuffling of waves on the shore. In all your hours, hold fast to it. In the crashing, dashing cycles of grievance and forgiveness. In the throbbing, pulsing revolutions of mistake and rectification. In the comings and goings and arrivals and departures that crest, fold in on themselves, wash up onto your experience then wash back down into your memory, the boundary between this and that, blurring in the swirling surf, the boundary between then and now blurring, in the watching soul, the surf and the soul, two tines of a tuning fork, struck, reverberating as one pure note called eternity or infinity or forever or love, until all that surging, snaky filament threads itself back into the needle’s eye. Elizabeth Ayres, author of Invitation to Wonder, Know the Way, Writing the Wave and two Sounds True audio albums, is the founder of the Center for Creative Writing, now celebrating its 22nd anniversary. 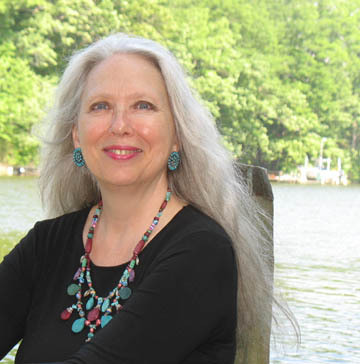 Her award-winning newspaper column has been delighting Maryland readers for over four years. Elizabeth lives with two cats, and spends long hours pacing shell-strewn Chesapeake Bay beaches, plucking words from the soft salt breeze. Her spiritual autobiography, Home After Exile, is forthcoming from Veriditas Books in 2013.